This is a residential property loss that followed a severe thunderstorm. Winds exceeding 50 miles per hour blew down a 6′ wooden dog ear fence. This particular fence had wooden posts, a 4′ gate, and a portion of the fence extended up a sloped embankment. The fence itself was 18 years old and was not a candidate for partial removal/replacement. The insured was frustrated because the neighbor’s Saint Bernard kept going over to the yard destroying her plants. The fence needed to be removed and replaced ASAP. This Insight Sheet is unique in that we essentially combined the mitigation aspect with the repair aspect. The reasoning behind this is that the fence contractor often removes the fence at the same time as the repair, thus these activities are often invoiced together as one estimate – this as opposed to the dry out being invoiced separately than the repair aspect. Building upon this notion, we included the line items associated with both the removal and the replacement. 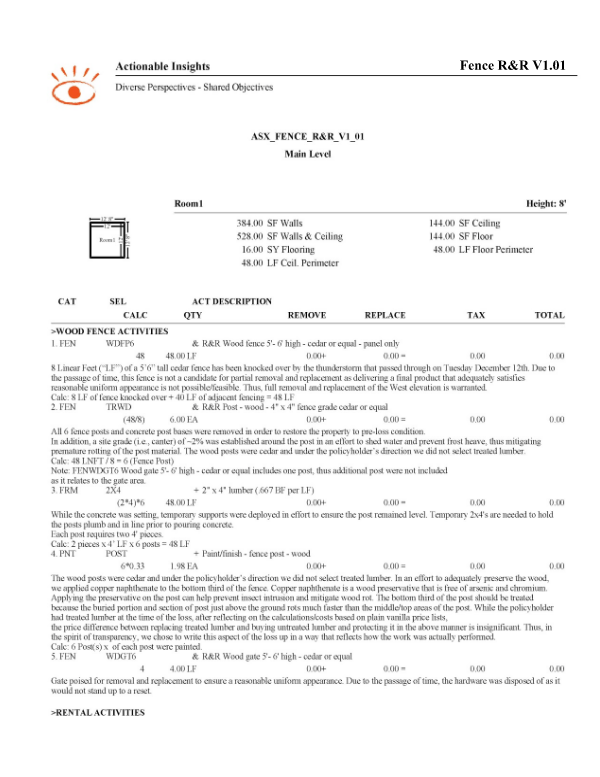 This Insight Sheet exists to clarify how one might invoice for fence repair. This does not seek to include or make concessions for all equipment and/or activities as it relates to a loss of this nature.